“Avant-pop” is one of the labels attached to this music from New York based Daniel Bennett and Mark Cocheo. “Synergistic jazz” is another. Neither does justice to these instrumental pieces, which bring together jazz, folk, pop, country, classical, folk and more in an always intriguing and enjoyable fashion. Not that I intend to create a more appropriate label – suffice to say that the duo’s distinctive sound, which Bennett has been crafting on record since 2004’s A Nation of Bears, is full of good humour and fun – characteristics that are not as common as they should be in contemporary jazz. The music on We Are the Orchestra was inspired when Bennett arranged the soundtrack to Whitman at the Whitney at New York’s Whitney Museum. 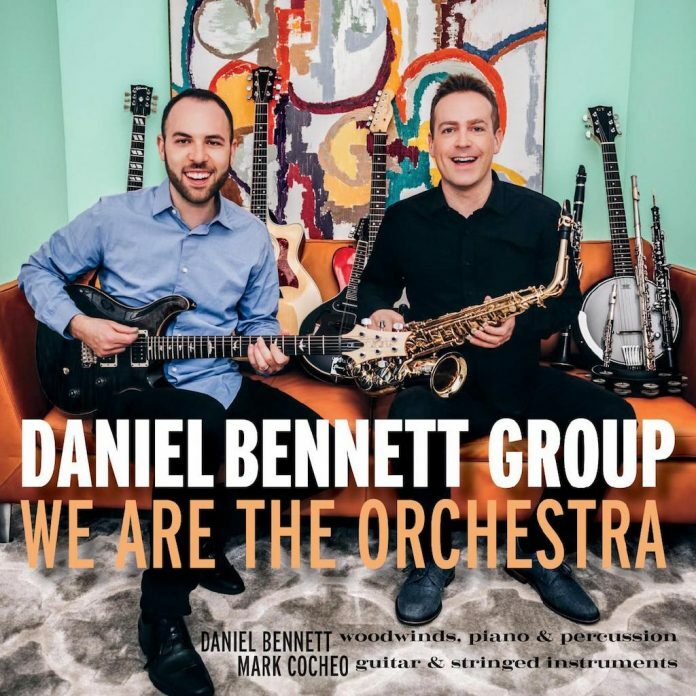 The album’s title is a nod to the full ensemble sound that Bennett and Cocheo create through their overdubbing of multiple instruments (there are 12 to choose from, eight played by Bennett and four by Cocheo). Whether it’s Bennett’s own compositions (“Inside Our Pizza Oven” is co-credited to Cocheo) or those of Giuseppe Verdi (“Theme from Ernani” and “Theme from Il Trovatore”), the duo’s sound is light and cheerful, characteristically combining bright, immediately engaging, melodies with simple but effective rhythms usually provided by percussion and/or Cocheo’s stringed instruments. Track titles also give a nod, this time to Bennett’s irreverent sense of fun. “Loose Fitting Spare Tire” is a jolly, countryish opener, its long, fluid, melody line giving it a sense of irresistible forward motion. Cocheo’s banjo on “I’m Not Nancy” continues the country feel. Despite its title, “Refinancing for Elephants” is the album’s gentlest tune, Bennett’s woodwinds taking the central role in the piece and giving it a touch of melancholy. Of the two Verdi compositions, it’s “Theme from Il Trovatore” that has the most immediate impact – Bennett’s overdubbed horns taking the lead part while Cocheo’s guitars provide the rhythm. “Carl Finds His Way” closes the album: it’s another tune characterised by an extended, flowing, melody line and some quirky percussion sounds and features Cocheo’s guitar at its rawest and funkiest. The whole album lasts just 30 minutes and each hearing left me with a sense of warmth, well-being and even optimism. Oh, and wanting more. Lovely. Bennett (as, ts, f, picc, cl, oboe, p, pc); Mark Cocheo (elg, g, bj). New York, no date. "...full of good humour and fun - characteristics that are not as common as they should be in contemporary jazz".